A vintage guitar with a country twang for the aspiring player. The lavishly ornate top wreaks charm. More bass would complete a balanced sound. What do the following share in common? The legendary Steve Vai, pop-orchestral band, Keston Cobblers Club, Japanese singer-songwriter, Miton Usui, and the inestimable rock guitarist Joe Satriani. A penchant for mini-golf? Midnight dips in the North Sea? Twerking? No, these guesses would all be wrong. They all have, and play, Ibanez acoustic guitars. 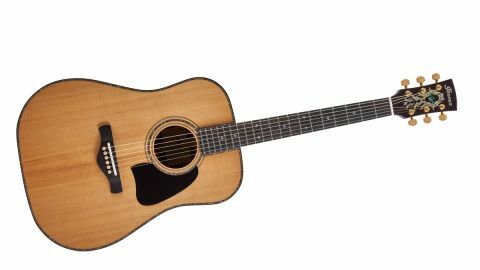 The model for review this month is the Ibanez AVD16LTD: a dreadnought, and one of the Artwood Vintage Thermo Aged TM series. The Ibanez acoustic range includes everything from the ukulele to the resonator and mandolin. It’s a busy market and what sets this model and series apart from the pack is the way its tops have been treated. This model has a spruce top, which has been ‘Thermo AgedTM’. Otherwise known as torrefaction, this process is relatively new. What this means in a nutshell is that the top has been cooked in a kiln to remove all moisture before gradually and carefully allowing small percentages of moisture back in. The purpose of this is for the guitar to produce is a full, round and seasoned tone. This is something we will return to later in the review. This Ibanez AVD16LTD comes with a black hardshell case. Set against the black lined body of the case, the guitar appears gloriously lavish. The aforementioned guitar top is made from solid sitka spruce and finished with gloss. It has a yellow-vanilla hue with a fine grain. Thermo-aging aside, it is the abalone purfling which takes centre stage. In one, almost seamless line, the abalone swings around the top, wraps around the neck and then seems to lasso the soundhole in one fell-swoop. In the rosette it is sandwiched by the double stripes of a darker wood. The pickguard, shaped like a human pelvis, abuts the soundhole, matching its curve, and provides ample protection from any overt right-hand strumming. The solid Indian rosewood back and sides have an even grain throughout and the dreadnought shape is accentuated by lighter coloured double line strips of rosewood. Down the centre of the back, these double lines seem to halve the instrument with an extra inlay of rosewood nestled between - it’s a subtle and effective manoeuvre that draws attention to the mirroring of the grain in the two halves. The dark ebony fretboard has mother of pearl snowflake inlays for markers. Combined with the wrap-around effect of the abalone, this show of opulence is reminiscent of the Martin D-45 - the epitome of luxury guitar ornamentation - a jubilatory display of inlays and add-ons, as originally requested by Hollywood’s Gene Autry (the country star who made his name as a singing cowboy on television and film). This Ibanez is a show-piece, and something those seeing you playing it will marvel at. While the main body of the guitar has been carefully constructed and decorated, what guilds this model to excess (if possible for this model) are the golden tuners. They feel a little gluttonous to say the least. Silver or chrome would have been a bit more understated but these Gold SG 301 Tuners, while smooth and reliable to turn, give the guitar an unnecessary glitz, particularly when the headstock already has the Ibanez logo spreading its verdant stamp over most of the top. The underside of the headstock, where it joins with the neck, sports a diamond volute (a signature of 19th century Martin necks), signaling another fine vintage detail. This guitar has a full tone and a clean sound - an absolute necessity given there are no onboard electrics. It has a particularly dominant mid and upper range; the bass is still strong but restrained. There’s space in the sound too. Each note has definition. This is the ‘Thermo Aged TM’ process at work. Playing piano on the Ibanez is sweet throughout but when pushed at the other end of dynamics, it doesn’t excel as much as expected, though this guitar is still in its infancy and the bass has ample room to develop. Accompanying the louder sounds are traces of a twang. As a consequence we try playing a rudimentary rendition of ‘Rawhide’: the guitar laps it up. Without a doubt it is in this country music vein that the guitar finds its niche. The left hand has a very comfortable time with the mahogany soft-V shaped neck. At the first fret it has a thickness of only 22mm, rising by only 2mm at the seventh fret. It is snug and you get the thumb over easily for any additional barring. There’s no cutaway but it feels comfortable playing in the upper range. The relatively low action means it doesn’t kill the fingers, so you can zip up and down the guitar frets without fuss. The body dimensions are fairly standard for a dreadnought - with a body length of 20” and a fractionally shorter lower bout width at 15 ¾”, you don’t have to make any compensations to your technique. While the pickguard might encourage use of the plectrum there are some great sounds here with good ol’ fingerstyle playing. You get the full range - from a soft, clean sound over the fingerboard to the angular, harsher sound by the horse saddle-shaped ebony bridge. With a plectrum, the sounds are crisp and the sound suitably vintage. The right arm sits comfortably on the top and the right hand has some good, pliable pressure on the strings: there’s a bit of give so it doesn’t feel like a tightrope wire. The choice of D’Addario Nickel Bronze strings is complementary to the large sound, producing lighter tonal qualities, which are transmitted from the cow bone nut and saddle all the way to the headstock. Guitar tapping gets a good reception too. There’s a natural reverb/echo that gives you plenty of scope for those who need that percussive sound. The harmonics aren’t outstanding but are sufficient for the package this guitar offers. Standing and playing is made possible with the maple end pin (which references the maple bridge pins), but with all the mother-of-pearl and abalone, we wouldn’t recommend busking off-piste. As a point of comparison we play the Ibanez against a Martin DX1RAE X Series, which also has a solid spruce top and rosewood back and sides. The neck of the Ibanez feels easier to navigate with the left hand. The Martin seems to have a slower response and the tone isn’t as bright compared to the Ibanez. These are qualities you pay for, though, as the Ibanez retails at £869 while the Martin comes in at £599. We also compare the Ibanez with an instrument at the other end of the upper mid range budget: the Martin D-15 ME with Fishman Thinline Gold. This is perhaps a slightly odd choice as it has mahogany top, back and sides. Playing both together though you can tell instantly just how responsive and full the sound is on the Ibanez compared to the Martin’s introverted mellow tones. If you look slightly into the soundholes you can see the thickness of the tops. The sitka spruce of the Ibanez is a slither next to the mahogany. You can immediately understand where the projection comes from and why. Ibanez, it seems, is catering for an increasing demand among guitarists for instruments that have a vintage appearance and classic sound here, right off the bat. There’s no time these days to be playing it in, taking it on the road to collect the obligatory gig scars that remind you of those gigs you’d like to remember, or perhaps forget. Perhaps it’s a symptom of the digital age. Or maybe Ibanez has cleverly crafted an instant classic for the beginner to intermediate player. It has the bells, it has the whistles and it’s easy to play. What makes this model all the more impressive is the price. At £869 it’s very competitive. Don’t forget it comes with a gig case too. There are some thoughtfully placed studs on the underside, as well as at the end of it, so your case can remain (all being well, of course) as untarnished as the guitar. The Ibanez AVD16LTD is like a top-of-the-range Martin guitar catered for the upper to mid-range budget of those who may have a secret desire for country music - no shame there. And if that’s the case, this will be the perfect accessory to those shiney boot buckles and Stetsons.